Busy bees keep the wheels turning here at 2Performant. And they’ve been hard at work this past month to deliver all sorts of goodies. 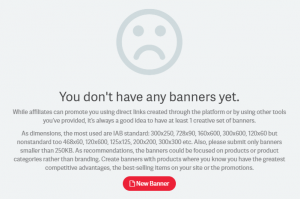 After having launched the advertiser promotion system in March, there were a few things that needed some tinkering. A few bugs here, a missing piece of information there, nothing our skilled developers couldn’t handle. Users have also got some UX improvements after the first round of feedback we received. 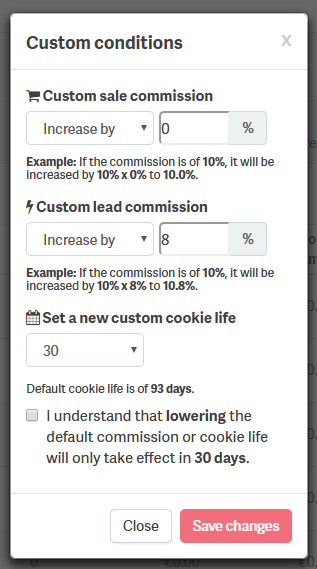 Just like we promised, affiliates can now receive custom conditions for leads as well. 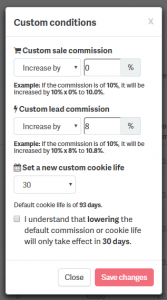 There’s a new piece of interface that allows advertisers to grant a different lead commission or cookie life to their best performing affiliates. We’re dedicated to performance, so we’re constantly monitoring our platform in search of database queries that take too long, missing indexes, sub-optimal implementation of programming logic. We’ve found a couple of issues this month, and fixing them means faster data fetching and response rendering for commissions and promotions. Remember when the grand total for the conversion rate was a bit weird, if you had multiple days summing it up? Neither can we, because that’s a thing of the past now. 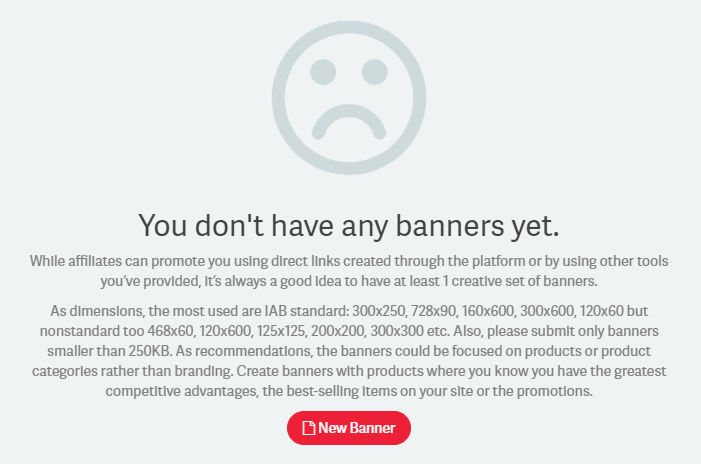 We noticed that it takes a long time for new advertisers to upload their first banner, so we decided to give them a bit of advice concerning this operation: why it’s recommended, what types of banners they need, some guidelines for the banners’ content etc. Due to the way our text indexing engine works, users couldn’t search for keywords that had dashes in them (“-“). We made that possible, so that you can find super–advertiser.com’s program a lot easier. Top affiliate programs in 2Performant! Apply now and start promoting!